DO YOU FEEL LIKE SAILING IN SARDINIA? Yes, I feel like sailing! Some months ago the Yanpy team got the unexpected contact from a leader company in yacht charter in Sardinia. They wanted to invite us for a sailing week in one of their sailboats so we could meet their team, fleet, and discover the amazing north coast of Sardinia: Emerald Coast (Costa Esmeralda) and the archipelago of La Maddalena. The boat was moored in the Marina of Portisco, just 15 minutos by taxi or car from the international airport of Olbia. Our host team was waiting for us. Ready to show their particular paradise nautical potential, and the most important, to make us live an unforgettable experience sailing for a week in sailboat along the Emerald Coast and its incredible archipelago of La Magdalena. Within a few minutes we were clear that both his crew, his yacht charter service, and his fleet were totally outstanding. The staff made us feel at home. We took the time to check in our amazing Dufour 412 sailing boat, plan the sailing route in La Magdalena and solve all our questions. His entire fleet is practically new and we were able to check at firsthand that the boats are handled with love. Note: You can find these yachts for charter in Sardinia available at Yanpy. Before getting into details with our sailing vacations through La Maddalena, we would like to share our general insights. Sardinia is a quiet place, still far from the massification. A Mediterranean corner with a smell of olive and pine trees, full of postcards of white sand beaches, pristine coves formed by granite rocks of impossible shapes and turquoise waters. DO YOU FEEL LIKE SAILING AROUND LA MADDALENA, SARDINIA? Get an offer with no strings attached! Probably, this place is not the best destination for nightlife lovers. 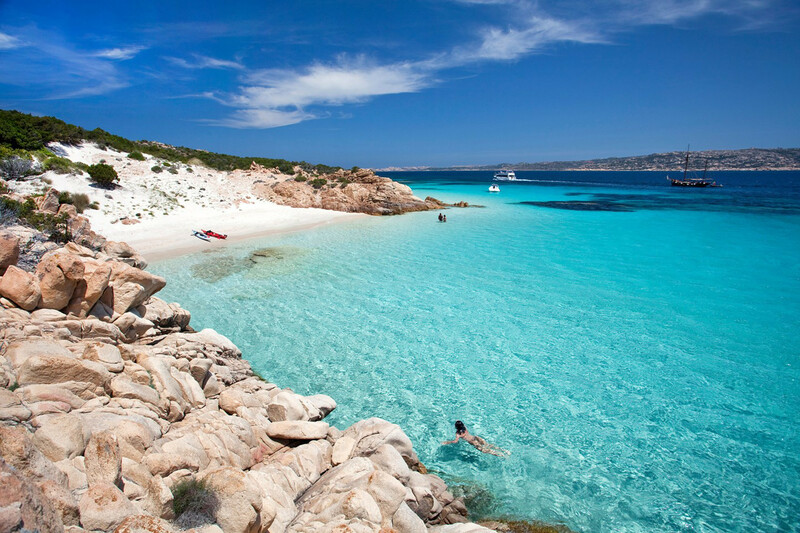 Once you begin your sailing week around Sardinia and La Maddalena your main activities will be to swim in turquoise and emerald waters, relax in the hammock of the boat while feeling the sea breeze, sailing, and walk along beaches and paths often deserted. Its people, proud of the beauty of their island, welcome those who visit this land, but protect it with passion to avoid that it becomes a mass tourist destination. These facts make Sardinia a paradise in the Mediterranean, perfect for a boat holidays enjoying its nature, beaches, sea, food and people. As usual in many areas of the Mediterranean, the climate of Sardinia is warm and sunny, with mild winters and slightly hot summers. The dominant wind is the Mistral (northwest) that blows with intensity in the famous Strait of Bonifacio (Bouches de Bonifacio), strait between Corsica of Sardinia. The best season to sail the Italian island goes from mid May to September, with June and September being the best months, as the weather is kind and the beaches are less crowded. It´s a place to sail carefully, due to the the numerous rocks of the coast. Thus, if you are dreaming of a relaxing time while a sailing holidays, to yacht charter in Sardinia with a skipper. will be the best choice. He will take care of everything and you will only have to worry about relaxing while discovering the beauty of the treasures of this paradise island. The Yanpy crew ran like clockwork all week long. So while some of them were in charge of provisioning the boat others did the check-in and carefully planned the route with the manager base. Our boat trip sailing for week around Sardinia was about to begin. We would sail for a few hours heading south to the Gulf of Aranci and the island of Tavolara. Afterwards, our compass would point north towards the archipelago of La Maddalena. There, we would enjoy some days discovering its incredible treasures in the form of Mediterranean forests, coves formed by natural granite sculptures and turquoise waters. Our goal was to reach Bonifacio on the neighbour French island of Corsica, crossing the famous and feared Bouches de Bonifacio (the strait of Bonifacio), a challenge for sailors. 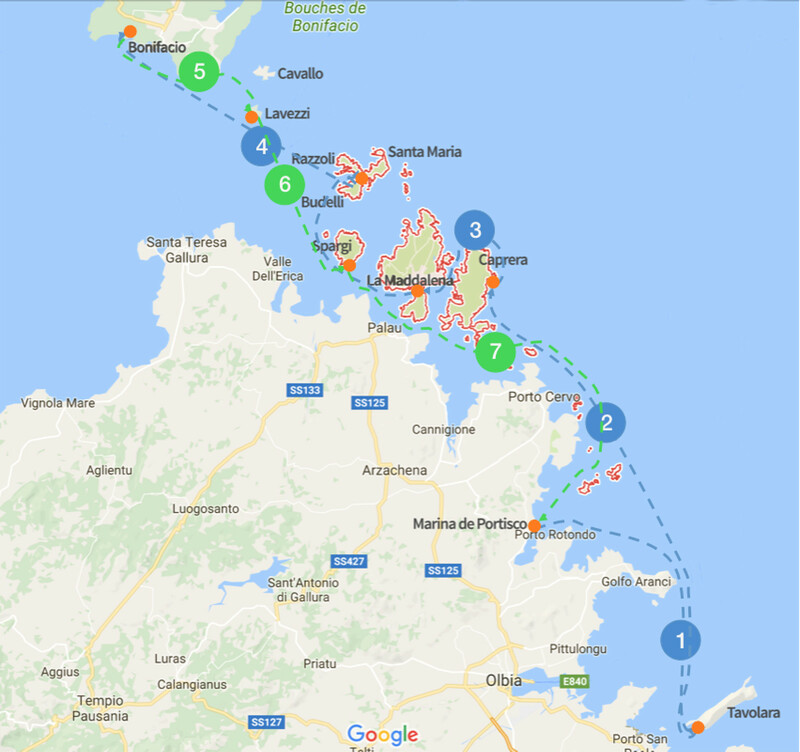 There, we would begin our return to the Marina of Portisco, visiting the islands Lavezzi and Cavallo, and the pending islands of La Maddalena. Our sailing trip in Sardinia was an amazing experience. Costa Smeralda and La Maddalena still have pristine corners where enjoy a lonely anchorage. Definitely a trip that we recommend to all sea, nature, tranquility and sailing lovers. If you want to know the details of our route sailing for a week through Sardinia and La Maddalena keep reading. Our crew was excited to leave the port. Finally, our captain gave the order, cast off! In afternoon our sailboat left Marina of Portisco behind head to the Gulf of Aranci. A beautiful place, where dolphin watching is very common. Our destination was Tavolara island. An imposing granite rock of 500 meters high, converted into a natural reserve that will delight all scuba diving, snorkeling and thousand colors sea lovers. If the weather conditions allow it the island provides a good anchorage. Alternatively, in the Gulf of Aranci you can find a small pier that offers a good shelter to spend the calmed night. Tip: In this area, usually in the morning, you can find local fishermen, to whom you can buy fresh fish. Alternative: If weather conditions are not good and you are forced to modify your route, do not worry. Sailing the southern coast of Olbia to San Teodoro has nothing to envy the northern route. Beaches of fine white sand and turquoise waters such as Dottore, Porto Istana (in front of Tavolara Island) or a little further south Cala Brandinchi are a gift for the senses. We woke up early on sunday. We had the longest journey of our route sailing through Sardinia. We would sail the Tyrrhenian Sea for 4 hours along the blue waters of the Costa Smeralda to our destination, the island of Caprera in the archipelago of La Maddalena. The trip was beautiful. An almost northern wind was blowing with intensity, but our rental boat sailed smoothly. The national park of the Archipelago of La Maddalena is formed by a group of 63 islands and islets, among which are the island of Magdalena, Caprera, Spargi, Budelli, Razzoli and Santa Maria. Most of the islands, with the exception of La Magdalena and Caprera, are inhabited, and the only way to get there is by yacht. Lucky we have our rental boat to discover its spectacular coves. Remember that to be allowed to sail in the park it is necessary to request a permit that you can manage here https://www.lamaddalenapark.it/. Towards noon we saw the Caprera island. The crew watched through the binoculars trying to guess some of their paradise bays and beaches. The choice is not easy. Sailing from the south we will find Cala Andreani and Cala Relitto. Then Cala Portese or also called Due Mari. All of them are impressive. These coves are dressed with fine white sand, crystal clear waters and a beautiful natural environment with Mediterranean vegetation that combines with the hardness of the granite stone. Although the water was still cool the crew could not resist taking a dip. Finally, our anchorage, the jewel of the crown, Cala Coticcio, also known as the Italian Tahiti. Our ship arrived in Cala Cotticio after mid-afternoon. Despite the wind, the cove offered very good shelter and we enjoyed a nice dinner with friends and a very quiet night. The next morning, we woke up early. When we went out on deck, we could not believe our eyes. We hardly talked to each other. We did not want to disturb that peace. We were anchored completely alone in paradise. The crew soon began to explore the surroundings. We conquer the beach, totally deserted, with our dinghy and paddlesurf board. We spend a good part of the morning discovering every corner by land and sea. After all, you are not always lucky enough to be alone in Cala Coticcio. We climbed the granite rocks that offered us a sight impossible to forget. I can only say that we keep great memories of that moment, in which we all fell completely connected with nature. It was not easy to leave Cala Coticcio. But our sailing trip in La Maddalena had to go on. We sailed along the north coast of Caprera towards the island of La Maddalena. On the way we left other coves also worthy of mention as Cala Napoletana, Caprarese, Serena or the famous Cala Garibaldi, named like this in honour to the famous hero of two worlds, Giuseppe Garibaldi. It is a day to enjoy the coves and natural landscapes that this archipelago has to offer. In La Maddalena it is worth mentioning the beach of Spalmatore or the peculiar beach of Testa di Polpo (Beach of the head of Octopus) with spectacular rocks of impossible shapes sculpted by the wind. For the night, you can go to the port of La Maddalena, located in the village with the same name. This small and picturesque villa is an old fishing village with lots of history to tell. Garibaldi, Admiral Nelson or even Napoleon left their footprints in this town proud of having resisted the French invasion. In addition to mooring for your rental boat, the streets of the village will offer you all kinds of restaurants where you can taste the famous Italian cuisine, while you comment with your friends or family, the incredible experience that is being sailing in Sardinia and the archipelago of La Maddalena. Want to find a yacht to sail around La Maddalena, Sardinia? Alternative: If you are in "lonely sea wolf" mode and you are looking for absolute tranquility, the island offers some natural anchorages such as the buoys of Cala Spalmatore or Cala Francese on the opposite side of the island. Tip: Just a stone's throw away is the spectacular Cala Corsara on the neighboring island of Spargi. A bay that well deserves more than a day of anchoring. Although we left it for the last day. Tuesday was excellent. After a relaxing breakfast with the crew, we set sail to Budelli, Santa Maria and Razzoli. We sail with our sailboat in a short journey until anchor in the center of these three virgin islands of Sardinia. On the way, we made a small visit to the icon of the archipelago of La Maddalena, the famous Pink beach (spiaggia Rosa). Italians take the conservation of their nature park very seriously, so this beach is closed to the public. So, once there, we did the only thing we could do. Take out our mobile phones, make serfies until our fingers hurt and upload them to our social networks. In a few minutes they were on fire. Once anchored between the three islands, the dinghy did the rest, taking us to discover the hidden coves. Cala Lunga, Cala del Cavaliere or Cala Aiacciolu are pristine coves of white sand and crystal clear waters of a turquoise blue that has nothing to envy the Caribbean. It's time to have a swim, enjoying those colors and explore the paths between coves on the islands. After a tasty fresh fish at our boat´s barbecue, we headed to the medieval village of Bonifacio on the neighboring french island of Corsica. Ahead we had a challenging day boat for every sailor, crossing the dreaded Strait of Bonifacio, the strait that separates Corsica from Sardinia. A place famous for its strong winds and its brave sea. Honoring their fame, the Bouches welcomed us with strong winds with gusts of up to 25 knots. Our charter yacht sailed smoothly and came to sail at 9 knots. The Yanpy crew enjoyed the trip to Corsica. I have to admit that until that moment we did not know anything about Bonifacio, so we didn´t expect anything from that place. Bonifacio was a discovery that left us with our mouths wide open. When our boat got closed to the coast of Corsica, the native land of Napoleon Bonaparte, we could see on top of the wind-sculpted stone cliff, the spectacular walled city of Bonifacio. Like a sentinel guarding the entire coast. We thought that place seemed unconquerable. Bonifacio has a natural harbor, guarded by its fortress. While our sailboat was entering it, we could only look upwards impressed by that place that evoked past times of corsairs. We moored our boat in the port, took land and walked up the steps that led to the walls of that fortress. A beautiful medieval village is hidden inside the old town. Its cobbled streets are full of typical products stores, where you can find local cold meats, wines, and handicrafts. We ate typical Corsican food, drank wine and even improvised a concert with a guitar borrowed by the friendly owners of the restaurant. Down in the port, you can find some pubs to have a drink and discos to deoxidize your body. If you charter a yacht in Sardinia, Bonifacio is definitely something you should not miss on your route sailing around La Maddalena. On Wednesday we started our return trip sailing around Sardinia. Before leaving, we bought freshly baked croissants at a nice french bakery in the port. We released moorings and left the surprising Bonifacio. The compass led to our next destination, the islands Cavallo and Lavezzi, two paradise islands belonging to Corsica. Along the way, we decided to enjoy a swim in the paradise island of Piana. An unknown island that hides a treasure, shaped like a beach of shallow turquoise waters and white sand, considered one of the most beautiful beaches in the world. After a refreshing swim and fabulous Italian food aboard our yacht, we continue our route sailing through Sardinia to Lavezzi. The islands of Lavezzi and Cavallo are a group of islands and islets that became natural reserve, whose beauty is inversely proportional to their size. Lavezzi is the largest of all and is uninhabited. By sea, a paradise of crystal clear waters rich in marine life that will delight the diving and snorkeling enthusiasts. By land, its paths between rocks of granite and vegetation connect the different coves of the island. Walking its deserted paths and feeling like an old explorer is the perfect plan for a nice noon. Cala di l'Achiarinu or cala di Chiesa are the most popular. Others without a name offer a more intimate anchorage. Caution: The rocks and reefs await us in these islands, so it is recommended to sail with special attention in this area. The Yanpy crew was making the most of the sailing experience by sailboat in Sardinia. The starring guess of our penultimate day was the island of Spargi, again in the archipelago of La Magdalena. Last stage before heading to the Marina of Portisco. Spargi was the final show. A deserted island of pristine coves. As our yacht sailed its east coast, the island showed us some of the most spectacular coves of our entire sailing trip. Cala Conneri, Cala Granara, Cala de la Belleze Naturali, or Soraya are small pearls of white sand and turquoise waters where we find less footprints than on the island of Robinson Crusoe. Charter a yacht in Sardinia to sail around La Maddalena is undoubtedly the best option to access many of the inaccessible coves offered by these islands. Our boat anchored again alone in Cala Corsara. It was a magical afternoon, where as in Cala Coticcio, we felt connected with nature once again. We explored every corner, we crossed the paths surrounded by vegetation that took us to other bays. The island showed us its best face. A peacefull afternoon and as icing on the cake, a colorful sunset that we will never forget. Next morning during breakfast, we were able to enjoy the peace of Cala Corsara. We had a few sailing hours ahead to the Marina of Portisco. It was a beautiful sunny day and gentle wind. The team relaxed during the trip along the coast of Sardinia. On starboard side we left the exclusive Porto Cervo, the capital of the Costa Smeralda. A corner where the world jet set gets together in summer. Luxury yachts with sizes of islands, exclusive restaurants and nightclubs or shops not suitable for all budgets. A place where it is easy to come across with some of the most famous faces of Hollywood or the world of sport. The end-point of our route sailing in Sardinia was the arrival at our destination in Marina of Portisco. There, our host team was waiting for us. That night, our hosts, impeccable to the end, invited us to a local wine tasting and a last Italian dinner on board our boat. Satisfied by the success of our weekly sailing trip around Sardinia, we enjoyed sharing with them every anecdote of the journey. Tip: There is nothing like bringing your own Italian chef to keep up high the morale of the crew. 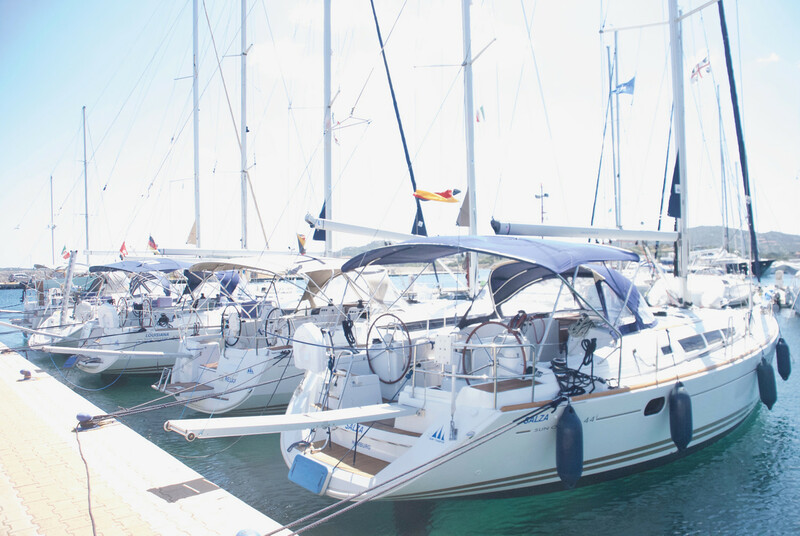 Renting a boat to sail around Sardinia is an unforgettable experience. We were lucky enough to check first hand the nautical potential of that quiet region of Italy, and to enjoy its paradise coves and its crystal clear waters. Needless to say, we are eternally grateful to our host team for the opportunity to live that experience sailing around Costa Smeralda and La Maddalena. If you feel like living this experience, you can find all their yachts in the section boat rentals in Sardinia at Yanpy. And what do you think of our route sailing around Sardinia and La Maddalena? Subscribe to our newsletter to receive more posts like this one. Excelente narración para navegantes que nos gusta la belleza natural! Hola Tomás, nos alegra mucho que te haya gustado nuestra ruta para navegar por Cerdeña y La Maddalena. Sin duda es un paraíso natural. Quizá puedas compartirlo con amigos marineros. Además, estamos abiertos a vuestras propuestas sobre nuevas rutas para navegar. Un saludo! El equipo de Yanpy. Buen día. Somo tres matrimonios de Argentina. Me podría decir precio e itinerarios para visitar Cerdeña y Córcega en septiembre 2018. Con patrón pero sin cocinero. Gracias! Buenas tardes Ángela, gracias por tu comentario. Si te parece nuestro equipo de reservas te contactará por email para solicitarte algunos detalles sobre vuestras vacaciones en barco por Cerdeña y poder enviaros un presupuesto personalizado. Un saludo, El equipo de Yanpy. Buenos días Mary, gracias por tu comentario. Si te parece consultamos disponibilidad y te enviamos a tu correo una oferta de barcos para visitar La Maddalena. Un saludo, El equipo de Yanpy. Buenos días Karmele, gracias por tu comentario. Por supuesto, en Yanpy ofrecemos todo tipo de oferta para disfrutar unas vacaciones en barco en Cerdeña y muchos otros destinos. Te contactaremos para consultarte los detalles de tu viaje y enviarte un presupuesto personalizado. Un saludo! El equipo de Yanpy. Dear Catarina, thanks for your comment. It´s difficult to say. Regarding the weather you never know. From our own experience, our team were sailing there almost in that date, on mid of may last year. We had 2 days with strong winds and five very lovely sailing days. I would say sailing season is starting on those days, but is not summer yet. So, is not easy to say. Maybe it´s not a bad idea to move the dates a couple of weeks ahead. Let me know if we can help you to get a boat for your sailing holidays in Sardinia. Kind regards, The Yanpy team. Dear Dolo, we are very glad you liked our sailing itinerary in La Maddalena, Corsica and Sardinia. We will contact you to your email to get some details about your sailing trip to Sardinia and send you our best offers. Kind Regards, The Yanpy Team.